I’m always a little hesitant when the “surprise hit comedy” kind of movie gets a sequel. If time has told us anything, it’s that most of these movies end up as nothing more than disappointing cash-grabs that fail to live up to the original. It’s nice to know that for the most part, this isn’t one of those situations. Anna Kendrick as Beca Mitchell. After an embarrassing performance at a prestigious event, the Barden Bellas must compete one last time in an international A Cappella competition to avoid being disbanded by their school. Pitch Perfect 2 is a charming yet predictable copy of the original film that still manages to bring on some solid laughs. The most notable aspect of Pitch Perfect 2 is that it manages to recapture and replicate the humor of the first film. It’s pretty common for comedy sequels to recycle jokes and double down on awkward moments, which is something that I don’t really like. Even 22 Jump Street, the funniest movie of 2014, crossed over into this kind of territory. However, I’m happy to report that this movie does not do that. Even though Pitch Perfect 2 comes wrapped in the same bold one-liners and quirky characters of its predecessor, it never feels like a cheap comedic rehash. As I mentioned before, it’s really the characters that bring the humor of Pitch Perfect 2 to life. Anna Kendrick still kills it with her unique style of comedy, while newcomers like Hailee Steinfeld and Keegan Michael Key stand out with impressive performances. 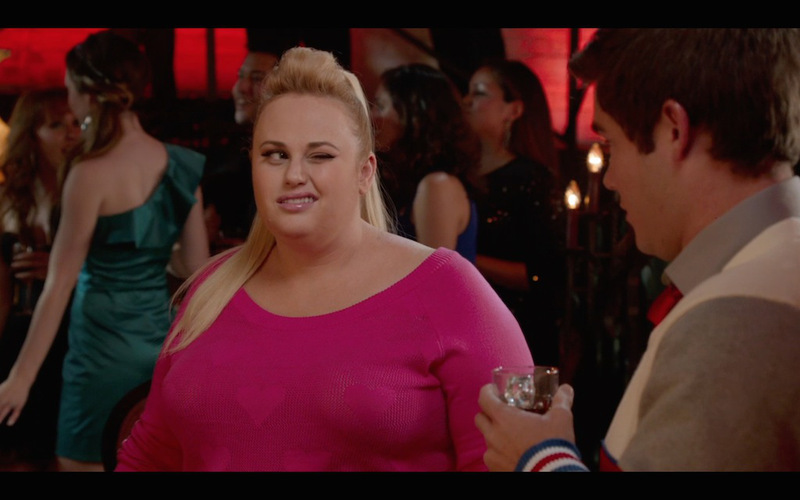 While everyone gets their moment in the spotlight, the minor character who stands out the most is Rebel Wilson’s “Fat Amy.” While I wasn’t a huge fan of her in the first movie, she returns with way bigger laughs than I was expecting. In addition to these standout roles, keep your eyes open for some hilarious cameos. There are plenty of them. Rebel Wilson as Fat Amy. The final thing that stood out to me was how much more entertaining the performance sequences were this time around. There’s much more variety in the kind of music you’ll hear covered in Pitch Perfect 2. Instead of a simple run of pop hits, you’ll see performances of everything from Muse to Pitbull, and seeing that range of style is great for music fans like myself. A lot of the pros I mentioned have correlating cons, such as the nature of some of the jokes. For every hilarious one-liner delivered, there was an unfortunately racist joke to match. This type of humor isn’t really that funny to begin with, and to make matters worse, they never really slowed down. They just kept coming, and it kept me from seeing certain characters as anything more than cartoons, meant to represent a stereotype. You’d think that some of the funniest women in entertainment right now would be a bit more tasteful. And while the movie didn’t recycle the jokes from its predecessor, it certainly reused its plotline. At some point during the movie, I asked myself, “How is it I’m able to predict so much of this?” The answer came in two parts. I’ve seen this exact story structure before. It was called Pitch Perfect. As enjoyable as Pitch Perfect 2 is, the disappointment comes when you realize that there’s really nothing new about it. This isn’t necessarily something that bothered me while I was watching the movie, but it did play a big factor when I started thinking about whether I’d want to see the movie again. If you loved the first one, you’ll love the second one. Pitch Perfect 2 may be a stylistic copy of the original installment, but that doesn’t change the fact that it’s still fall-down funny. At the end of the day, that’s all that really matters. What did you think of Pitch Perfect 2?